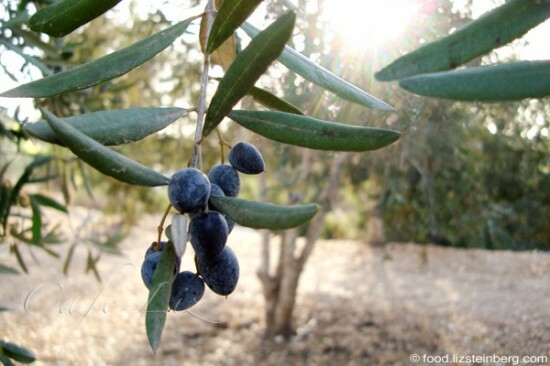 It’s that time of year — the first autumn rains, which mean the olives are ripe. Admittedly, I haven’t seen more than five minutes of rain in Tel Aviv so far, but it’s been on and off the weather forecast for a few weeks now. I’ve heard rumors that in some places, it actually poured. Several times. Likewise, the olive harvest has been in full swing for a few weeks now. The trees are said to give a good crop only every two years, and this is the year. Farmers and people with trees have been picking olives by the bucket. You can comb your fingers down a branch adorned with fat olives, and they’ll come off in your hand. For those of us in Tel Aviv, there are the trees in public parks — along the Yarkon bike paths, and along Ben Gurion Boulevard, for instance. I’ve heard some people say they actually picked olives from those trees — generally, the trees just drop their fruit all over the sidewalks, leaving a dark, greasy mess. But the easiest way to get your hands on a batch of fresh olives is to wait until they make it into the markets. It took a while for them to get to the Carmel Market, but they appeared there this week, and in force. You can buy them where you’ll find them every year around this time — by the olive stand on Yihye Street, parallel to the main market street (Carmel Street). The guy there has entire crates of Souri olives — one of the most popular types for pickling here. For the lazy types, you have the usual selection of about a dozen kinds of pickled olives, too. But let’s say you don’t want the readymade version. Pick through the boxes of fresh olives, looking for unbruised fruit free of bug holes. They’re usually about 10 shekels a kilo at this point — significantly cheaper than brined olives. 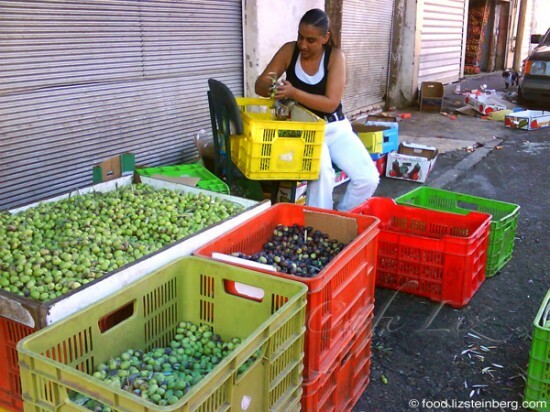 The woman in the photo has the thankless task of separating riper olives (reddish brown fruit) from less ripe olives (green fruit). They’re all ripe enough to be used, though. By the way, if you’ve ever wondered why people don’t eat olives raw, meaning unpickled, now’s your time to find out. Taste one. It won’t be fun, but it won’t kill you. As someone once said to me, you’ll be the first person to eat an unpickled olive in about 8,000 years. So now you have your fresh-from-the-tree olives. What to do with them? Cure them, of course. How? You have several options. 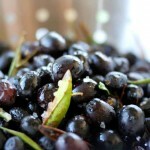 Olives are often made edible through use of lye. Here in Israel, that’s not a very common method — we prefer using lemon and salt. Now I guess the lye isn’t poisonous, since people don’t usually die from eating olives, but I feel much more comfortable knowing I’m eating something that was prepared with common kitchen ingredients, not harsh chemicals. The most common pickling method here involves lemon, salt and spices. I explained a bunch of curing processes in my two olive-pickling posts two years ago, Do-it-yourself olives (basic technique) and Do-it-yourself olives, part 2 (more creative methods), but we’ll summarize here. The process is pretty simple. Crack the olives if you choose, put them in a water bath and change the water every day for a week or two, and then put them in a basic brine solution for at least another week or two. Cracking the olives makes what’s called zeitim dfukim (hammered or “messed up” olives) in Hebrew. Cracked olives release their bitterness and become cured much more quickly, which is good if you want to eat your olives as soon as possible. On the other hand, uncracked olives can sit in brine and taste fresher for much longer — last year’s uncracked olives now taste quite good, while the cracked ones are a little soggy and overpickled for my taste. You can crack your olives by pounding them with a heavy object. Expect to be splattered in olive juice. Last year, I gave each olive a slash with a knife instead, which doesn’t open the olive quite as much as cracking it, but was a lot easier. As for the rinsing process, it may not sound so environmentally friendly, but it takes away the bitterness — and it turns an utterly inedible fruit into something humans have been enjoying for centuries. Submerge all the olives in water, and replace the water every day for a week or two. After about a week or two in the brine, your olives will be ready to eat — the complete pickling process, including the soaking, takes about three weeks. You also could leave them much longer — they won’t go bad. Don’t worry if any mold forms on top of the water, it’s not harmful. If you want, you can prevent mold from growing by pouring a thin layer of oil on top of the brine. You also could play with the seasonings — I’ve added Mediterranean herbs, and others have pickled olives with nice vinegars, instead of lemon juice. (See the links at the end of the post). Among the other methods I tried, the best ones involved packing olives in kosher salt (detailed in Do-it-yourself olives, part 2). You usually see black olives prepared this way. Put them in a cloth bag, pack them in kosher salt, and let them sit for a few weeks, flipping the bag so that the moisture under it evaporates. Then, remove from the salt, toss in olive oil, and refrigerate until you want to eat them. So, go out there and enjoy olive season! 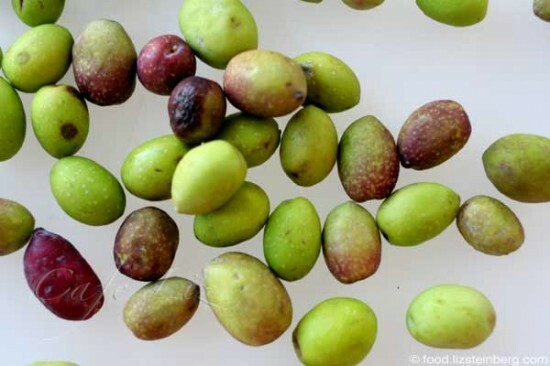 Sarah reviews the history and methods of curing olives, and describes several olive varieties popular in Israel. Ben picks 250 kilos of olives and has them pressed into oil, with photos of the whole process. Ben pickles lots of olives and gives some recipes with twists. Beyond pickling: Sarah ruminates on olive trees and Miriam marinates and cooks her olives. 12 Responses to "It’s that season: Pickling olives for another year"
visited the Galil yesterday- hiking trip to nahal akhziv, anyway all along the olive groves on the side of the roads families were busy harvesting olives the old fashioned way. They spread a tarp under the trees and shake or wack the olives off the branches. We didn’t get a chance to photograph but it seems to me it is the most pleasant way to spend the weekend. I tried salt pickling this year- not completely successful as I need to do a better job separating the dark purple from the black. For a lower salt brining method I was told to use only a teaspoon of salt for each cup without any flavor additions (extras like lemon slices and garlic will ferment with so little salt). For extra flavor the olives are marinaded over night in fresh lemon, garlic, parsley and whatever herbs and spices you wish. My friend does it like that it is quite good. I have family that uses the lye method as well which is a much faster way of curing (no week long soaking), but the flavor is never as good, too industrial. Thanks Sarah. Those all sound like interesting ways to pickle your olives. What happened to the lighter olives in the salt pickling? And where are your relatives who cure their olives with lye? In Israel? I’d be interested to find out if people do that here, too. Awesome post, Liz. 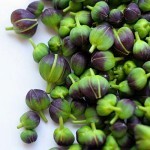 I’m going to head to the market today or tomorrow to get some. It’ll be my first olive pickling experience. I’m better versed in kimchi, surprisingly. Definitely something you should try at least once 😀 Actually, I’ve never made kimchi. Great, informative post, Liz. I’ve pickled green olives already but this makes me want to get some black ones. 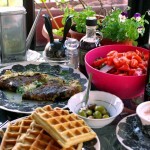 Nice new look in your blog! 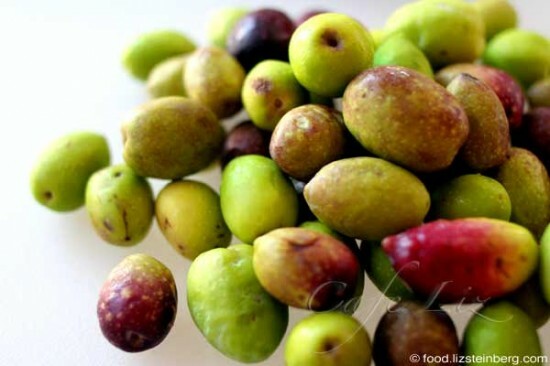 I used to pickle my own olives when my son’s father had a garden with olive trees. Lovely seeing you all! Yalla, cure some olives! That’s part of what makes me uncomfortable knowing that it’s used to process food … even if people don’t usually die from eating lye-cured olives.